Bovis Homes South East region's ongoing support for the Invicta Foundation, an organisation founded to support wounded troops, has seen the Essex-based charity take a step closer to their first target. Bovis Homes have raised almost £3,000 for the charity started by Stephen and Cheryl Hall after their 22-year-old son Ashley lost both legs when struck by an IED while serving in Afghanistan. 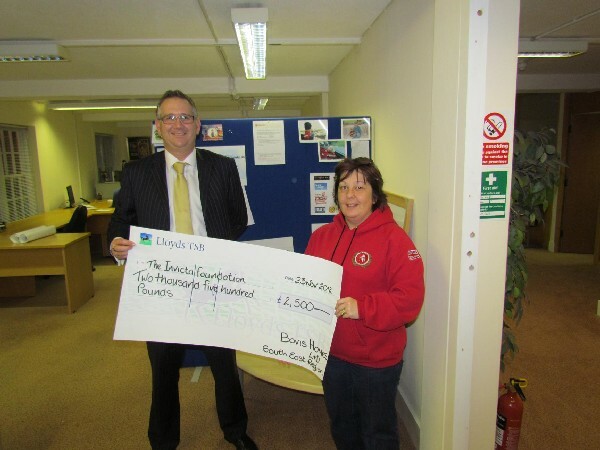 A large proportion of the money was presented to Cheryl recently by South East Area Build Director Ian Hamilton (pictured). But is not only cash that the region has contributed, and the skilled team at New Ash Green have now drawn up plans for a specially designed respite home to be used by wounded soldiers and families when they have been discharged from hospital. Cheryl said: "We have now got the floor plans and elevation views of the house. Visually it makes more of an impact for people to see what we want to do. "We are really happy with them, they look fantastic. Bovis Homes have done exactly what we wanted them to do, which is to give us a home from home." The Halls hope that this first home will be the first in a series built across the country and their next step is to meet with Colchester Council and explore any parcels of land that might be available for the project. There is a special connection between the charity and Bovis Homes - not only are they based near to the old Cavalry Barracks land where we are building Quadriga in Colchester, but the founder of our company, Charles William Bovis, is Ashley's great, great, great, great, great uncle. South East Managing Director Nick Twine said: "We have tried to help out not just by raising funds and donating items, although this is obviously important to help a new charity get off the ground, but also by working closely with the Invicta Foundation to understand their goals and develop a long-term relationship with them. "We have had a number of meetings with Cheryl and Stephen, who provided us with a 'wish list' and we have been happy to assist wherever we can over the last year or so, offering our expertise and advice wherever possible with a view to seeing this vital property built."